Thats really good of you to offer to check the newspaper archives for me,I really appreciate it. I tried the web address for the David Ingham site but it didn't seem to work. "Could I ask what your interest is in John Lavin? He happens to be a member of my "extended" family (to be exact, he's my wife's grandad's (also named John Lavin - served in the 7/Border Regiment 1917-18) cousin). I believe that my father-in-law has a bit of info. on him." John Lavin is also part of my extended family. I would be happy to pass on any details I if you are interested. Could I ask what your interest is in John Lavin? He happens to be a member of my "extended" family (to be exact, he's my wife's grandad's (also named John Lavin - served in the 7/Border Regiment 1917-18) cousin). I believe that my father-in-law has a bit of info. on him. Thanks for the lookups! They are very informative. As for John Lavin, like I said in the above post he was a distant cousin. I have some information about John, but if your Father in law has anything to add it would be greatly appreciated. This is a transcription of a Burnley Express news paper article (date unknown). John Lavin is briefly mentioned as he was a cousin of these McCarthy Brothers. Family That Has Been Hard Hit. -- Two Brothers Killed, Two Wounded, Cousin Missing. A family very hard hit by the war is that of the McCarthy's, one of whom as announced Wednesday's issue, has now been presumed dead, after beig missing at the Dardenelles from August 9, 1915. It is a remarkable record of four brothers and a cosuin. All were in the East Lancashire Regt. Two brothers have now been killed; one has lost his left eye but is still serving; whilst the cousin, Pte. Lavin, has been reported wounded and missing since July 1st last, and there are no hopes that he is alive, as nothing has been heard of him, either officially or otherwise since. The unmarried McCarthy brothers lived at 11, Leyland Road, and the cousin (the only cousin) resided with his widowd mother in Pitt Street. Two of the brothers, John and Thomas, and the cousin enlisted within three days of each other. The eldest of the McCarthy brothers is Sergt. Michael, who is forty years of age. He served in the Boer War, and was a reservist when the present war began with the 3rd East Lancashire Regt. He was on going out attached to another battalion, and has been wounded twice -- once at Neuve Chapelle and once at Salonika. He has now been in hospital at Salonika for the past eight months. He is unmarried. Denis McCarthy, the second brother, has been rejected for military service, but he is working munitions. The third, Pte. 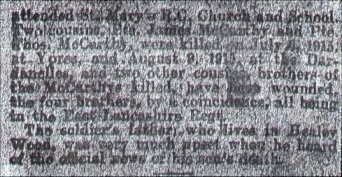 James McCarthy, who was 33 years old at the time he was killed, was with the 1st East Lancashire Regiment, and previous to joining the Army worked at Cooper's Foundry. He was married. He was killed at Ypres on July 6th 1915. He was a reservist having been with the colours seven years. He went through the Boer War. He left three little children, and on his dead body was found a photograph of his wife and children. John McCarthy, the fourth son who is 32 and married, and belongs to the 6th East Lancashire Regiment lost his left eye through a bullet wound received at the Dardenelles. He was just coming out of the trenches when he was hit. He was taken to a hospital at Port Said, and afterwards came to a hospital at Brockenhurst, Hants. Pte. John McCarthy is still serving, being at the headquarters at Plymouth. He was formerly a joiner's labourer. The fifth brother, Thomas is now presumed to have been killed after being missing at the Dardenelles since August 9th 1915. He was 23 years of age then, and previously was employed at Rowley Colliery. At the time he was missing a comrade said he was wounded in the head and body, and then disappeared. Their cousin Pte. John Lavin, also of the East Lancashire Regiment was wounded and has been missing since July 1st. It is feared that he is dead. The McCarthy family are connected with St. Mary's Roman Catholic Church. Thanks for that. Interesting to note that a (ex)workmate of mine used to live at 11 Leyland Road a few years ago, and I've been in there for a brew quite often when I was working at the mill (we just used it for storage when I was there - no I can't weave cotton!!!) at the top of the street. You may already have this, but in case you don't, here's John Lavin's obituary from the Burnley Express (August/September 1917 - unfortunately, I didn't note the exact date!). Apologies for the quality but, believe me, it's an improvement on the one held on microfilm at Burnley library. There's a definate likeness between this John Lavin and his cousin John (my "Grandfather in law" ?). You'll note that the McCarthy's also get a mention. Just noticed, reading the two obits. , it's funny how innacuracies creep in. In one obit, Pte.Lavin has been missing since July 1st, in the other, since July 21st. In one obit it mentions him living with his widowed mother, yet the other mentions his Father, living in Healey Wood (where Pitt Street ,where his mother lives, actually is!) being "very much upset" at the news of his son's death! Thanks for John’s obit – I had not seen that before and it gives me a lot of new information to work from. Do you have any other information on John Lavin or his family? I have attached the news article I mentioned yesterday. It is hard to read but it has grainy photos that bring the people to life. Perhaps you already know but Townley Hall in Burnley will be holding an exhibition on Burnley soldiers who were killed during WW1 (runs for 90 days and ends 11 Nov). p.s do you live in Burnley? I've sent you a response to your PM. Just to make it a little easier, send me what you know about John Lavin, and I'll see what (if anything) I can add. (As I mention in my PM, I've mainly got info on the "other" John Lavin). I did know about Towneley Hall's exhibition, but thanks anyway. (I think that Towneley's displays have improved of late. - they went from good to average to bloody awful ,back up to not bad over the past few years, although I do miss the "Scarlett Room" with the model of the "Charge of the Heavy Brigade").I'm quite hopeful that this will be pretty good. Many thanks for the recent obit on Sgt D Brady (17950-Wcoy 11th Batt) you kindly provided. 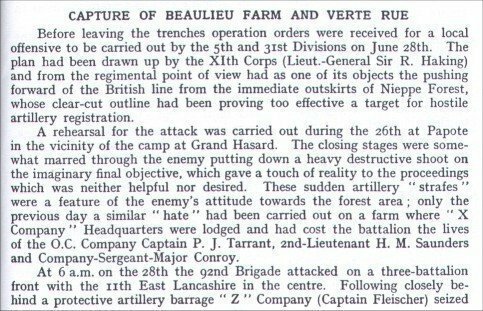 From this I would ask that is there anything in your records regarding the attack at Beaulieu and then Gombert Farm (La Becque) on 28 July 1918 - it was here I believe he was wounded, subsequently dieing at St Omer. Corporal Thomas Hatch No36921 East Lancs Regiment. I have his VM & BWM, he was my mother in laws father.. I know nothing else and would be very grateful if you could check if there is any mention of him in the books you have. One final thing and sorry for continueing to bother you (however it appears you have a great knowledge of the local regiments) do you have anything in the way of information on the Loyal North Lancashire Regiment and specifically on the 9th Battalion of that regiment? i.e. listed men, theatre of operation, a copy of the war diary? I would ask that is there anything in your records regarding the attack at Beaulieu and then Gombert Farm (La Becque) on 28 July 1918 - it was here I believe he was wounded, subsequently dieing at St Omer. Nothing mentioned as far as I can see. His service number strikes me as one belonging to the 7th Battalion ELR, though, (if that's of any help). do you have anything in the way of information on the Loyal North Lancashire Regiment and specifically on the 9th Battalion of that regiment? i.e. listed men, theatre of operation, a copy of the war diary? I've got the Official History for this regiment too. (If you use the "search" button in the "Unit Histories" section of this forum, you'll find me advertising my wares for this unit there). Anything specific that you require? Just to keep you going, though, the battalion was raised in Sept.1914 and served in France and Flanders, arriving in France (Le Havre) on September 24th/25th 1915. The Bn recieved the following battle honours: "AISNE 1918", "YPRES 1917,'18", "Loos", "SOMME 1916,'18", "Albert 1916", "Bazentin", "Pozieres", "Ancre Heights", "Messines 1917" , "Pilckem", "St.Quentin", "Bapaume 1918", "LYS", "Estaires", "Bailleul", "Kemmel", "Scherpenberg", "France & Flanders 1914-18". (Those in capitals were entitled to be borne on the colours). Re Tom Hatch, its a start.. The chap I'm interested in from the 9th Loyal North Lancs was 10892-Cpl William Henry (Harry) Kay of Oldham, he was my great grandfather. I have his medals also including the military medal, gazetted on 18/10/17 (no citation though!). Other than having evidence he was captured sometime after this I know nothing other than he was repatriated after the war. My grandfather told me he knew nothing because Harry would never talk about his experiences which after reading through various forums would appear to have been quite commen. Anything you hold will be a start before I go to Fulwood barracks.. Chances are that he was awarded the MM for some action in August 1917, possibly for the capture of the Westhoek Ridge on 10th August, or in the holding of their new positions during the night of 11th-12th August. I say this because practically for the whole of July, the 9/LNL were engaged as working parties repairing roads, reconstructing comms trenches, improving water pipes, etc.etc. under the disposal of the CRE, II Corps.. They then went into the above action and were withdrawn to the Steenwerke and Eeke area on the 17th August ,remaining here untill early September when they were holding trenches in front of Glencorse Wood and Stirling Castle. On 9th September, they moved south of Bethune and were involved in reorganisation and training for 3 weeks. Nothing of note happened for the rest of the year. No mention of Cpl.Kay in the LNL History. Spent the morning looking through the "search" you suggested. Amazing what you can learn if only you take the time to look back! Many thanks for any help you can give me!